Have question, comment or concern? Please share with us. Applications for the 2018 season are closed and all vendor spaces are full. If you’re interested in being a vendor in 2019, please leave your email address so we can send you updates next year! start receiving emails about the Holiday Pop-Up Shops. set up my food truck at the Holiday Pop-Up Shops. play music at the Holiday Pop-Up Shops. Since our opening season in 2012, each year has gained more foot traffic, experienced more media attention and been more financially successful for our local shops. The 2017 season was no exception - our shops reported their highest sales numbers and our customer count exceeded previous years. This event would not be possible without your support. 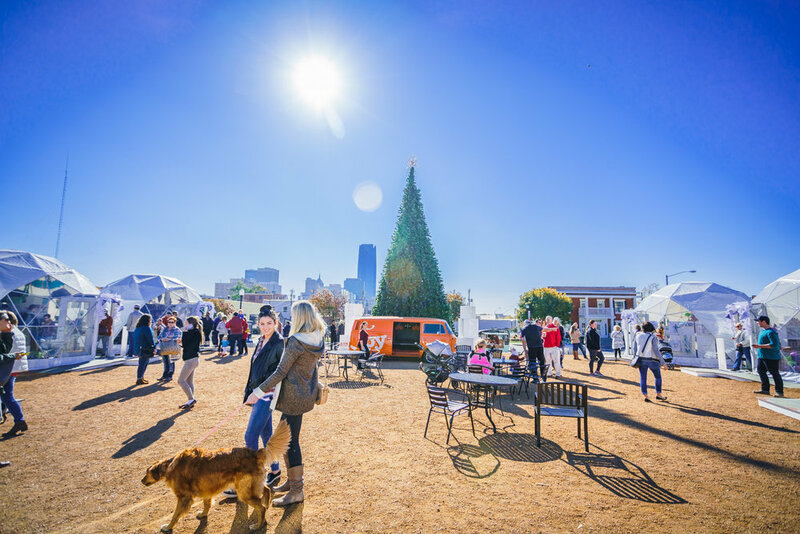 We'd love for you to participate in spreading holiday cheer in OKC and support local shops by sponsoring the 2018 Holiday Pop-Ups. North Pole Partner - $10,000 - Reserved for one highlighted partner. Dome Partner - $5,000 - See your name in lights...on a dome. Brand association with a specific dome, including using your brand as an identifier on social media. Ice Partner - $1,000 - What’s cooler than cool? Ice cold. Snow Partner - $250 - There’s no business like snow business. Our Snowfall partnership is perfect for restaurants and small businesses with ties to Midtown. Restaurant or beverage partners may trade out this partnership for food or beverage service during a Top Shopper night. Email shops@bartabailey.com for more information. All partners... receive a Dropbox full o’ digital goodies containing logos, posters, cards, photos and things like that. We’ll make it easy to outfit your social media profiles and show your support for the Shops.